It is tempting to judge this saw on its looks, and there it is certainly a winner. Moreover, the range of choices available in the handle wood, saw nuts, and back allow the customized aesthetics of this tool to be especially pleasing. More substantively, the fit and finish are magnificent; there isn’t a hair out of place. My Bad Axe 10″ dovetail saw has a .018″ plate, 16 tpi rip teeth, set about .002 each side, with a mesquite tote, blued steel back, and brass saw nuts. However, a tool must be ultimately judged by its performance, which simply means how it can help you make things out of wood. I’ve used this saw for about nine months now, and, despite some excellent Western and Japanese alternatives to which I had become accustomed, the Bad Axe has become my clear favorite. When I pick up this saw and approach the wood, it feels just right in my hand. Though relatively beefy for a dovetail saw, the handle contour, low hang angle, and especially the balance work together to impart eagerness to go at the layout lines. When the saw does bite into the wood, the truly superlative sharpening completes the functional integration. In many side-by-side tests with my other saws, I have gotten the most consistent accuracy and feel the most confident with the Bad Axe. It is now the saw I reach for. A bit of relaxed tooth rake toward the toe of the saw helps start the cut. The tooth line is canted about 1/8 from toe to heel. These are both helpful features, though, to find quibbles with the design, my preference would probably be an increase in both of these. 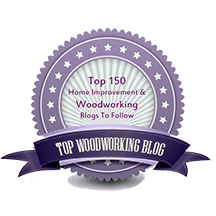 The Bad Axe Tools Works website gives detailed technical information on the saws, and, ultimately, you will have to get one of these saws in your hand to appreciate how well it works. There is something more important that I want to tell you about this tool. I think of it similarly as my Japanese Daitei chisels and French Auriou rasps. 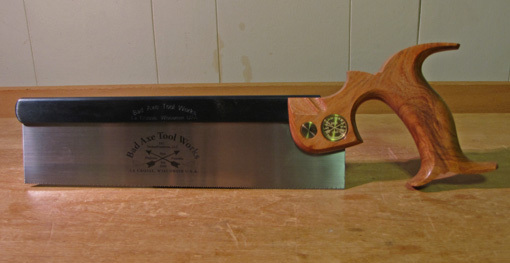 The Bad Axe saw is a tool with a soul, but in this case it is a characteristically American one. This is born of the personal commitment of its maker, Mark Harrell, a man who has spent much of his life serving America. 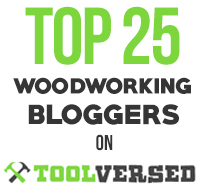 Mark understands saw making history, listens to the input of many woodworkers (disclosure: including me), and is passionate about innovation, refinement, and excellence in producing a saw that you will not mistake for any other. Further, he allows for a range of your choices in saw plate, filing, handle size, and materials. Yes, the soul of the tool is meaningful and I sense it when I bring the Bad Axe saw to the wood. Thanks Rob for the mini review. I’m especially interested inasmuch as I’m not all together satisfied with my current western dovetail saw as you know. I think one of the really tempting features of the bad Axe saw is that they offer choices in handle size. Do you think the longer length of the blade makes any appreciable difference in using the saw? The balance of this saw is great, and I like the 10″ length. 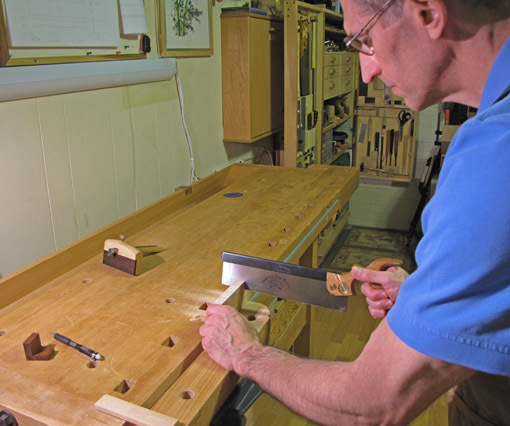 Because the filing and set are so good, once you groove your stroke with this saw it tracks very well, so the length and balance further work in your favor. Mine is set about .002 each side and it feels just right – with a careful start the saw really carries itself true through the cut. I can’t emphasize enough how good the sharpening is. Hang angle + balance + weight + excellent sharpening = good cut.